A visitor looking at different new products of Google. 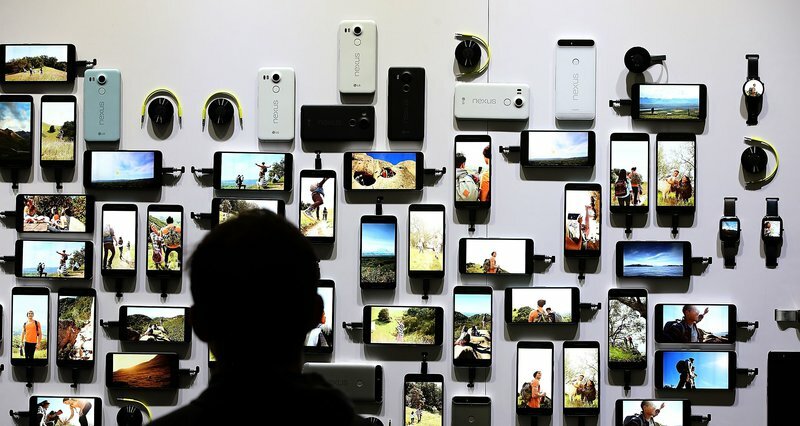 Google has launched two new models of its own phone, the Nexus, which are designed to make the most of the company's in-house operating system, Android, and return in some ways to its origins by offering advantages at entry level at a more reasonable price than the competition. The announcement by the CEO Sundar Pichai came just a few hours after Apple posted a new sales record with their new and much vaunted iPhone with 13 million units sold in the first three days. The new Apple hit Catalan stores in early October and is priced at 749 euros. As Apple has done, Google also wanted to offer two models of different sizes, although in this case the two differ somewhat in functionality. As with previous models, the production has been outsourced to third party manufacturers. The larger model, the Nexus 6P, will have a 5.7 inch screen and is produced by the Chinese firm Huawei, while the 5X (5.2 inches) is manufactured by the South Korean LG. Both models use the latest version of Android, dubbed Marshmallow (known here as the Candy Cloud). This operating system will be available here immediately on release for for existing Nexus users. The company's mobile platform is a key element in Google's strategy to make the most of revenue from online advertising, as computer navigation leans toward Apps. Both the Nexus 6P and the Nexus 5X incorporate a digital fingerprint sensor on the back, which allows access to the phone with a simple touch and ID confirmation for purchases in stores using Android Pay's automatic payment system. Both devices also feature a 12.3 megapixel camera with better performance and the ability to record 4K video. The main difference is with the front camera and its eight megapixels for the 6MP while the Nexus 5X remains at 5MP RAM. Both phones also have a new function to process data collected by the various sensors and determine if users are walking, running or riding a bicycle, so that the user can record any physical activity at all times. The basic models of the Nexus 5X will sell for 379 dollars and 6P for 499 dollars. Both include free access to the Google Play Music service for 90 days, but it is not yet known how much they will cost here nor when they will become available. This is the first time that Google has launched two phones at the same time since it began its Nexus programme in 2010 and it could be interpreted as an attempt to keep up with Apple, which has rapidly regained the advantage in high-end phones. As well as the phones, Google also announced its first Android-powered tablet, manufactured entirely by the company. It is called Pixel C and will have a starting price of 499 dollars. It can accommodate a keyboard, suggesting that Google plans to to compete with the likes of the iPad Pro or Microsoft Surface, aimed more towards productivity and entertainment. Throwing caution to the wind, the Mountain View (California) giant also presented a new version of Chromecast, a device to stream content from a PC or mobile to the TV, as well as a similar model to wirelessly connect to speakers and play music.